Just like her English namesake, "Liza" is BUSY, BUSY, BUSY!!! She is from a highly successful combination doubling on our Wild Pride as well as the English littermates Ra and Rainbow - soundness through and through! She was handled to her Championship exclusively by Sally and has had some wonderful wins starting with a Puppy Class FIRST! at the 2002 National Specialty under Norway's Ola Holsing ("Tortasen") as well as being BOS in the Sweepstakes there under Connie Britt. "Liza" was co-bred and is co-owned with Linda Atcheson of Bermuda. Bred but one time to date, "Liza" whelped one male "sparkler" on July 4th, 2007 to SBIS English Ch. Kestos Kriega. She "wintered over" in Bermuda 2007-2008 and at the six Bermuda shows in November of 2008 scored an amazing SIX Hound Group Firsts as well as one all-breed BEST IN SHOW under Canadian judge, Mr. Jack Ireland along with her Bermudian title. Not bad for a Veteran! 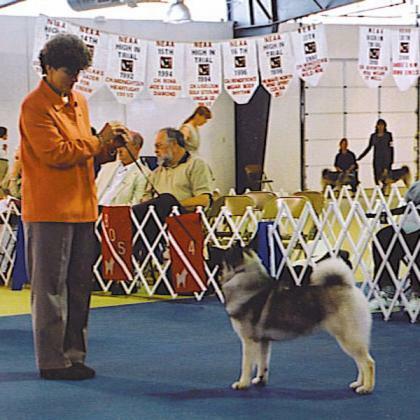 In later life she was Best Veteran in Show at several of the Bermudian events shown by her longtime friend Sally. Moving back to the states in later life with Linda she made herself right at home in her new abode in Maryland.